The first time I watched Labyrinth I had not yet hit double figures. 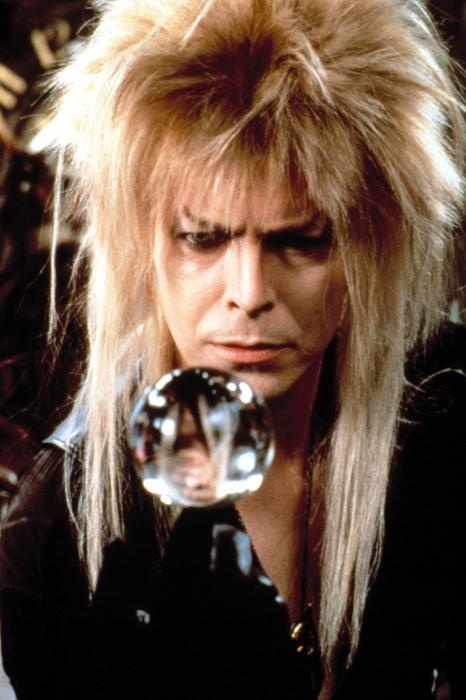 David Bowie, in his role of the Goblin King Jareth, both terrified and fascinated me. Despite several nightmares about goblins, the film became a firm favourite throughout my childhood years. Fast forward to the present day and I still love Labyrinth, but question certain elements of the film a little more. For example, Jareth's ambiguous relationship with Sarah: "I ask for so little. Just fear me, love me, do as I say and I will be your slave." No Jareth, no. Sarah's wardrobe is still fabulous and I'm impressed that, despite staying busy hating/loving Sarah and setting several traps for her in the Labyrinth, Jareth's make-up always looks so impeccable. The dance party in Sarah's bedroom at the end of the film is still a highlight, although I am less jealous these days. I have my own friends to make dance parties with. When Big Sister Binns sent out a group email, inviting us to attend the Labyrinth Masquerade Ball at the Prince Charles cinema, I booked my Eurostar tickets immediately. Masks were purchased and dresses were brought out of the wardrobe. One friend dressed up as Jareth, 80s blonde wig and all, but without the distracting crotch bulge. Flora and I missed most of the pre-show, hosted by the Goblin King himself*, as we were at the bar getting drinks in. It soon became obvious to us however that there were certain rules to be followed: sob like a baby when Toby came on the screen, scream with delight when Jareth appeared, in his tight leggings and fabulous capes, sing-a-long to all the songs, and enthusiastically support Sarah when she made a sensible decision (i.e. rejected Jareth's creepy attempts to get her to stay in the Goblin Kingdom). The atmosphere in the cinema was really fun and I enjoyed seeing the film again in such enthusiastic company (there were some vocal Sarah fans in the audience). A wave of nostalgia hit me during the ball scene "As the World Falls Down". I was transported back to my adolescent years, which were full of confusion and angst like everybody else, and mourned the carefree aspects of my childhood. Much like Sarah, I'd enjoy a dance with Jareth then get the heck out of the Labyrinth to find a decent guy with a less flamboyant dress sense. Oh wait, I've managed that last part. Now I just need to get Bowie on the phone and request a dance. I'll leave you with this shall I? * This was not the real DB. It was a very good impersonator.